Lemoine discusses the findings of his study. 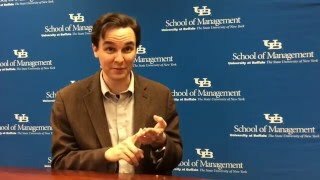 BUFFALO, N.Y. — When establishing goals for their organization, managers should avoid setting overly ambitious goals because they can hurt productivity, market performance and employee morale, according to new research from the University at Buffalo School of Management. The study indicated that employees are turned off by goals they see as unrealistic. They’re motivated more by small wins and challenging, incremental goals than by seemingly impossible stretch goals. Published in the Journal of Substance Abuse Treatment, the study analyzed 219 substance use disorder treatment centers—a field in which the researchers discovered organizations use harmful stretch goals almost as frequently as more constructive, challenging goals because of resource uncertainty and fiscal instability. The researchers found stretch goals were most harmful in organizations that had recently experienced success. Of course, the question of whether a goal is difficult or impossible to achieve is subjective. Lemoine recommends managers consult with employees on whether they perceive objectives as realistically attainable. Lemoine collaborated on the project with Terry Blum, PhD, professor, Georgia Institute of Technology Scheller College of Business, and Paul M. Roman, PhD, Distinguished Research Professor of Sociology, University of Georgia.